A man in Washington State has been charged with a felony after he allegedly cut the brake line on his girlfriend’s truck when she refused to get an abortion. The News Tribune reported that 31-year-old Justin Dean Herrick was arrested after his pregnant girlfriend found fluid near a front tire and a cut brake line. His girlfriend told Pierce County sheriff’s that she broke up with Herrick after he allegedly asked her to get an abortion. Herrick was using the girlfriend’s truck and was ordered to return it and to move out immediately she said. It was when the truck was returned and Herrick’s now ex-girlfriend began to drive it that she discovered the brake lines had been cut. The woman, who is seven weeks pregnant, told police that she believed the Herrick tried to kill her and their unborn child. According to news reports, Herrick admitted to cutting the brake line and has pleaded not guilty to attempted first-degree assault and third-degree malicious mischief. Life Dynamics has documented the violence pregnant women can face when they refuse to submit to abortion. 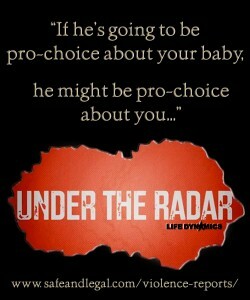 The report, entitled Under the Radar Violence in the Conflict over Abortion has been uploaded online. You can also read additional stories on this blog here.